Today’s Photo Safari is slightly different, in that it will be brief and contain only one picture. The goal of this article is to, I hope, inspire each of you to go on your own safari once you have learned about, and seen more than the entrance to, Timeless Beauty. At the age of 28, Kayuyoshi Miyoshi became the youngest recipient of the prestigious Kimura Ihe-e award for his book of photographs entitled Rakuen, a Japanese word meaning both ‘pleasure garden’ and ‘paradise.’ Mr. Miyoshi has continued to pursue this philosophy of rakuen in his work, capturing earthly paradises in his native Japan and also in the Himalayas, the Maldives, Africa, India, Tahiti and the Antarctic. In 1998, Miyoshi published his series entitled The World Heritage In Japan. Images from this series were selected by the Japan Foundation to tour the world as a scenic ambassador for Japan’s natural beauty and cultural legacy. Kazuyoshi Miyoshi was born in Tokushima Prefecture in 1958, and graduated from the Tokai University School of Letters in 1981. His works are included in the permanent collection of the George Eastman International Museum of Photography and Film. He won the 2004 Fujimoto Shihashi Sashin Bunka Award, and served on the judge’s panel for the 2009-2010 Nikon Photo Contest International. His images of Shikoku pilgrimage sites have been featured on official Japanese postage stamps. 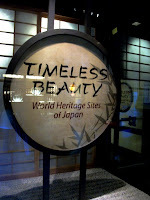 While I would love to show you some of the breathtaking images of the gallery, the Japan Foundation, which sponsored the tour of this gallery, has asked that no photographs or video be taken due to the religious and cultural sensitive nature of some of the sites. That is why I hope that each of you will take the time to go on your own personal safari and take in the gallery in your own time and pace. I haven't had a chance to see this yet, but what a great article. It will definitely help with my trip to Japan in April (yes, I am just bragging now!). But I hope to be able to see this exhibit the next time I'm in Epcot.